In his Second Edition of How to Comply with Sarbanes-Oxley Section 404, Michael Ramos incorporates new developments and lessons learned in the last two years into the definitive guide on SOX 404 implementation . . . An effective tool not just for consultants, this book is THE reference guide for every corporate manager facing SOX 404 implementation. 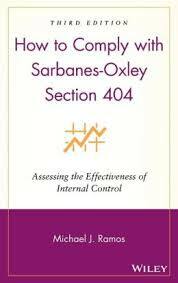 Sarbanes Oxley was a great cpe course. The price was low and the testing materials were great and the test was graded online.